President Trump is speaking at a government-owned tank plant in Lima, Ohio, the last facility in the U.S. where tanks are built. The Army announced earlier in the year it would spend $714 million to upgrade the M1A1 Abrams, which is built at the plant. The White House has said the infusion of spending will support more than 1,000 jobs. In his remarks, the president reiterated his earlier declaration that ISIS will be “gone by tonight.” The president held up two maps he had shown to reporters earlier at the White House, one of which he said was from Election Night, and the other representing the current status of the caliphate. 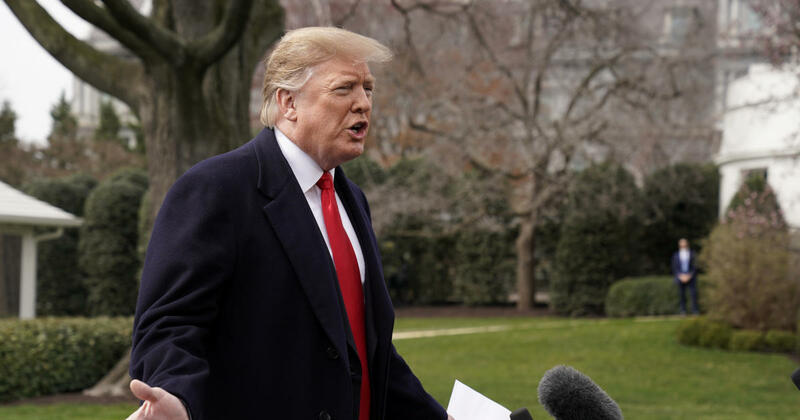 Before leaving the White House, the president also said he looks forward to seeing special counsel Robert Mueller’s report. “I don’t mind … Let it come out. Let people see it,” the president told reporters. In Ohio, Mr. Trump will also attend a country club fundraiser, days after he pressured U.S. auto giant General Motors to reopen a plant in Lordstown, Ohio, that closed earlier this month. Mr. Trump has been berating GM over Twitter and pressuring CEO Mary Barra to take action — “sell it or do something quickly,” he tweeted. This visit focuses on defense, however. His plant visit and speech comes as the president is touting manufacturing in the U.S. under his leadership and requesting an increase in defense spending. Air Force One touched down in Ohio at roughly 2:20 p.m. Eastern time. People who attend Wednesday night’s fundraiser can get their picture with the president — for $15,000, according to the invitation reviewed by the White House television pooler. The last few days, the president has spent some of his time attacking the late Sen. John McCain — “I was never a fan of John McCain and I never will be” — and George Conway, the husband of his top aide Kellyanne Conway who has repeatedly criticized the president’s mental fitness on Twitter. Mr. Trump, speaking to reporters on the White House South Lawn, claimed he told Mueller he wouldn’t be the FBI director. “Let it come out, let people see it. That’s up to the attorney general,” Mr. Trump told reporters when asked if the impending report of Special Counsel Robert Mueller’s Russia investigation would be made public. “I want to see the report,” he added, saying that he “looked forward” to its release. “Whoever it is, I’ll take him or her on,” Mr. Trump told reporters earlier this month. The president, after largely taking a break from political travel since the midterms, rally supporters in Michigan next week. Mr. Trump is holding a “Make America Great Again” rally in Grand Rapids, Michigan, on March 28. There, he’ll emphasize manufacturing as a part of his agenda. At the same time, he’s likely to attack what his campaign considers to be “radical socialist” policies embraced by Democrats.